The Riverboat Captains & Mansions Walking Tour will take you down to Napa Abajo – one of the oldest neighborhoods in the City of Napa – along the Napa River. Mark your calendars! NCL’s annual Riverboat Captains & Mansions Walking Tour is around the corner! 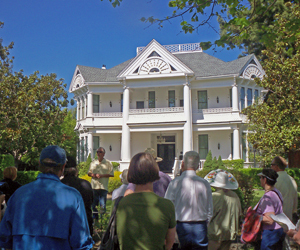 The Riverboat Captains & Mansions Walking Tour will take you down to Napa Abajo – one of the oldest neighborhoods in the City of Napa – along the Napa River. It should take about 45 minutes to 1 hour, longer if you choose to access the additional information provided for some of the sites. The route is easily walkable and about 1 mile. There are few crosswalks and most streets do not have stop signs, so be cautious and look both ways before crossing. The sidewalks are in fair condition, but be aware that many of the trees have uprooted large sections of the pavement. It is led by Scott Sedgely, Napa Councilman and traditional Riverboat Captain Tour Leader!